Leading off today: Northport pulled off a huge rally on Monday to hand Connetquot its first girls volleyball loss to a Long Island opponent since late in the 2014 season. Sydnie Rohme recorded 20 kills, Katie Kullack had 20 digs and Sophie Campbell added 30 assists in the Tigers' 21-25, 23-25, 25-19, 25-23, 25-19 victory at Connetquot. Connetquot, winner of two of the last three NYSPHSAA Class AA championships, hadn't lost to a Long Island opponent since the 2014 Long Island Class AA championship against Massapequa. The T-Birds' last regular-season loss came earlier that season against Smithtown East. Connetquot graduated six players last June who currently play in Division I.
Northport was 3-7 last fall but is 3-0 in the current season. "I think Northport played well, and I think that they played fearlessly," Connetquot coach Justin Hertz said. 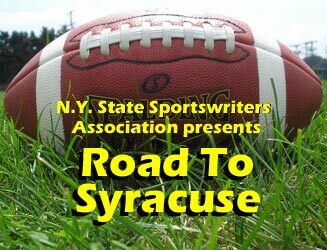 Forfeits confirmed: Section 3 Executive Director John Rathbun confirmed Tuesday that Syracuse Corcoran has forfeited non-league football victories over Baldwinsville and West Genesee. Syracuse.com reported Sunday that a Cougars player who was ejected from the team's final game last year and should have served a one-game suspension to begin the current season appeared in both of the now-forfeited wins. The forfeits mean the West Genesee is now 3-0 and Baldwinsville is 1-2 this season. The forfeits won't affect playoff seedings, which will be based upon the Cougars' results against divisional opponents. Policy change: Rochester Mayor Lovely Warren announced that the city school district will work directly with its police department to plan security measures for "major sporting and other school events" in response to fights among spectators at Marina Auto Stadium during Saturday's football game between East and Wilson. Warren met Monday with schools Superintendent Barbara Deane-Williams, interim Rochester Police Chief Mark Simmons, two school board members and administrators. "Much like it currently does for other city special events, festivals and concerts, the RPD will now coordinate throughout the year with school officials to ensure these events have comprehensive security plans that include police input and approval," an announcement from the city said. Saturday's game came to a stop twice. The first stoppage lasted approximately 45 minutes. School district officials met with police, then the teams were allowed to play the final 6:54 of the second quarter. The stadium was then cleared, and there were reports of more confrontations outside the facility. Observations: (1) Given the history of spectator violence at basketball games involving Rochester City School District participants, it's surprising that the policy introduced Monday didn't already exist. (2) If Police Lt. Samuel Lucyshyn's estimate that the fighting involved just 10 to 15 individuals out of the approximately 1,000 spectators is accurate, then that's a pretty sad statement about law enforcement's ability to deal with such situations given the massive response of officers to the scene. (3) There was still no word as of late Tuesday morning if or when the game would be resumed. Safety understandably is the primary concern, but the result of the game is going to have a huge affect on how the Section 5 Class A tournament get seeded next month. Following up: The Syracuse CBA football player who collapsed in Friday's game is improving but may require further treatment, Prin- cipal Matthew Keough told Syracuse.com on Monday. "He is currently resting comfortably, fully engaging in conversation, and has full mobility as he awaits additional testing," Keough said in a statement. Milestone goals: Delaney Rutan scored two goals, the second giving her 100 for her career, as Cincinnatus defeated Schenevus 3-1 in the championship game of the Oxford Tournament on Saturday. Sarah Paige's 100th career goal came with just 27 seconds left in Fort Ann's 2-0 win over Whitehall last Tuesday. "We kept trying to feed her the ball," coach Jason Humiston said. "Her parents brought a bunch of flowers, didn't want them to go to waste." Milestone victory: Saratoga Central Catholic volleyball coach Maria Izzo picked up her 300th career win Friday as the Saints swept Berlin 3-0. My favorite quote of the week: Athletic trainer Eric Reeves has been giving Susquehanna Valley athletes mustard as a way to combat muscle cramping. I've heard of pickle juice as a remedy, but mustard is a new one to me. "That's his secret weapon for cramping, mustard," football coach Mike Ford said. "He let the kids know, like it or not, if you start showing signs of cramping you're getting the yellow mustard on the sideline. "We've got a couple condiments on our sideline, we've got syrup if they get a pancake block so, we're working our way to that barbeque."